GenSpace Opening :: December 10, 2010; 7:00 pm :: The Metropolitan Exchange Building, 33 Flatbush Avenue, 7th Floor, Brooklyn, NY :: RSVP: Daniel Grushkin: 917-340-0591 or dgrushkin [at] genspace.org. 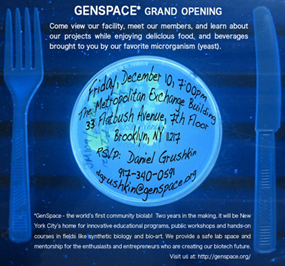 Please join us in celebrating the grand opening of GenSpace — the world’s first community biolab! View our facility, meet our members, and learn about our projects while enjoying delicious food and beverages brought to you by our favorite microrganism (yeast). Two years in the making, it will be New York City’s home for innovative educational programs, public workshops and hands-on courses in fields like synthetic biology and bio-art. We provide a safe lab space and mentorship for the enthusiasts and entrepreneurs who are creating our biotech future.